Impeccable Penthouse Loft Conversion recently completed at a cost of nearly $200000 with timeless design & thoughtful finishes. This is the nicest Penthouse by far in the building. Light abounds this open plan with nearly 1700 Sq Ft under Air. Cityscape is a Modern 19 Unit Boutique building with 20â Ceilings dual pane Walls of Glass & Exposed Metal Ductwork. The Spacious Open Kitchen with Cooking Island was designed for entertaining. The Loft features 2 Beds & 2 baths & 29' long Terrace with Southern Exposure so plenty of room for outdoor dining. Gaze past the new Bamboo Floors to a views of the Sarasota Bay Big Pass & Gulf beyond. The Generous Master Suite is upstairs with a Sumptuous Zen like Master Bath with luxurious soaking tub cantilevered over the rooms below walk in shower and dual sinks and tons of strorage. Downstairs the large 2nd bedroom doubles as a Den or Library with double pocket doors and bookcases & also a dedicated laundry room & large air conditioned storage space in garage. Made Restaurant is located in the Lobby Melting Pot Restaurants & Office Bar are also in Building. Condo fees include Includes 24 access to Evolution Fitness on 2nd floor. Mediterraneo Restaurant & a dozen restaurants withing 2 blocks Hollywood Stadium 11 Theater across the Street Payne Park tennis courts at your door step. 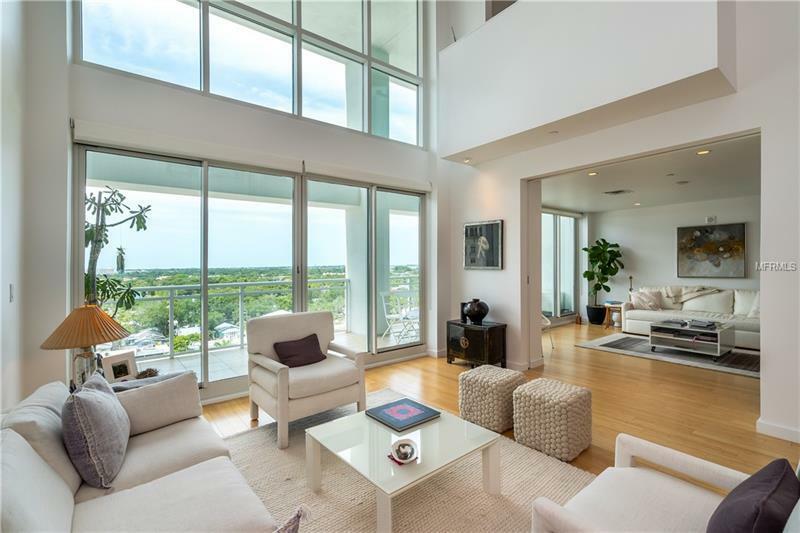 Cityscape at Courthouse Centre is the only building with 20â Ceilings in Sarasota and best value downtown for a Modern Condo so great for Urban Professionals or Seasonal Residents. Pet Restrictions: 45 lbs limit per condo docs but unlimited size for "Service Animals"